eBay officially launched the eBay Partner Network last week. What this network allows you to do is make money by driving traffic to eBay. Previously, users would have to rely on CJ.com as a way to get paid by promoting eBay. However, eBay has decided to launch their own program and make it easier for affiliates to generate the income they desire. The process is very simple… as soon as you sign up you’ll be given access to numerous promotional eBay tools and resources to start sending traffic to the site. Using your own site or blog, you can display many different sizes of ad formats and text links. Visitor tracking is also available and allows the user to be directed to their country specific site, such as eBay Germany if the visitor happens to be in Germany. This happens automatically behind the scenes and as an affiliate, you only have to worry about generating your own country links – eBay takes care of the rest. How do I get paid? How much can I make? Because eBay owns PayPal, payments are handled easily without any hassle. Affiliates will be paid via PayPal after their pay period ends. Alternatively, you can be paid via direct deposit as well. If you want to learn more about paypal go to this link. How much you make depends on how many visitors you bring to eBay and the amount they spend. 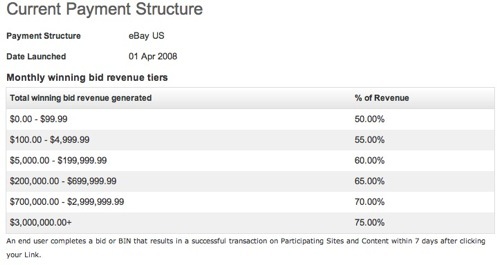 Take a look at the eBay payment structure. You also earn money based on referrals… take a look at the chart below. Why would I choose this network over Commission Junction’s eBay affiliate network? Let’s face it – people hate CJ. Whether they’re not getting approved for an account, or not having their affiliate commissions tracked, users are quite frankly fed up with CJ by now. Having eBay launch their own partner network will ease many headaches of internet marketers everywhere. This is only the beginning of good things to come in my opinion. New to eBay? Take a look around before signing up. Existing eBay affiliates have to migrate over to the new eBay Partner Network if they want to continue to get paid for driving traffic to eBay auctions (I believe the cut-off is sometime in May). People have to be careful to read the TOS for each country program before applying to make sure their method of promotion is OK for that country. The only universally OK method of promo is SEO.